My husband has done a lot of "beating back nature" along a few hundred feet of our driveway in the last two years or so. There were some dead trees and some noxious weeds that needed to be cleared out. In the process, he began to notice that there was a lot more wild fruit growing there than we realized. A lot more. The more he trimmed, the happier those fruit bushes, vines, and trees became. They were getting a bit of light and began to bear their fruit. We found wild apple, chokecherries, thorn apples, wild grapes, plus some others which have not yet been identified. Very cool! I have longed for some more fruit-bearing plants and had been planning for some planting areas, but there they were all along! We didn't have to plant them, weed them, trim them, or spray them. What a gift from God! I can feel His delight in our discovery of this gift to us. 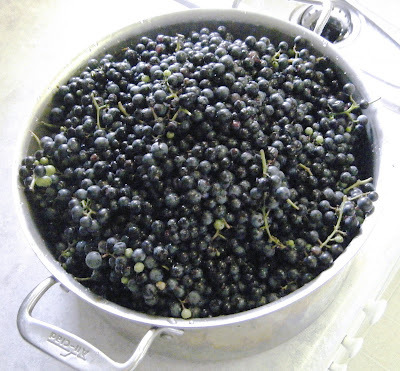 On Thursday my dear husband picked 2 1/2 gallons of wild grapes along our driveway before he went to work. There's more to be had, but it's a good start. The kids and I cleaned them carefully, picked over them, then threw them, small stems and all along with a couple of cups of water into my 8 quart stockpot. It was heaping full. I cooked them down then strained out the seeds, stems and pulp. I added sugar to the juice and a few pinches of salt and some pectin, boiled it for a minute or so, then canned it up. This batch made 17 half-pints of jelly. Luscious grape jelly. Rich and full-bodied flavor with a little "wild" tang. Not at all like the cheap jelly we usually buy in the store. 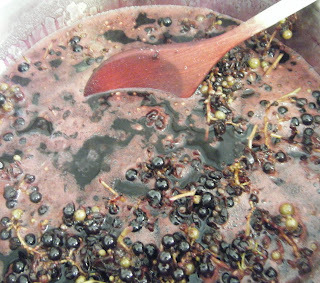 Women have been making wild grape jelly for many generations, but it's new to me. and it's so good too! 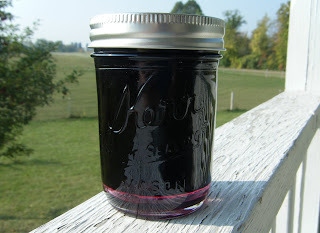 The wild grape jelly is delicious! Thank you for sharing.